Very early in life she felt drawn to Art, Literature and Theatre. Her musical training started at school with eight years of classical guitar lessons. After the completion of A-Levels in 1982, she finaly left Italy in order to qualify in Musical Education at the University of Regensburg (Germany). 1985 she plays the Role of the Girl in the play Die Versicherung of P. Weiss directed by Ulrich Pöppl in the Studententheater Regensburg. 1990 at the Scuola Teatro Dimitri in Verscio/Switzerland and 1991 with Desmond Jones in London Giovanna still moves between Commedia dell’Arte and Mime. 2004 she comes across Dominique De Fazio – Protégé of Lee Straßberg (Actors Studio) – and his Program for Professional Actors in Rome, Milano, Munich and Hamburg and finally finds what she was looking for: the Poetic Theatre. 1988 Giovanna won the Youth Litarature Prize of the Regensburger Schriftstellergruppe International and in 1998 the Literature Prize „Amalia Rosselli“ (Rivello/Italy). As Giovanna was assistant director of J. Berlinger – 2004 the play Die Pfarrhauskomödie (H. Lautensack) at the Turmtheater Regensburg – she gains a vast experience in the field. For her this was a professional cornerstone so led her to opening Grenzgänger, her own theatre project in Regensburg from 2005 to 2007. A private stage production was completed with refugees from Afghanistan, Iraq and Bosnia. On moving to Berlin in 2009, the new project Teatro delle Voci, an Audio-Installation with walkable stage is performed. Thanks to the Italian Institute of Culture (IIC) and the Cultural Association Malaparte e.V. the spectators themselves experience space and sound space. In 2010 and 2011 Giovanna returns to the stage as a performer in both plays of M. Majce, Ein Aufenthalt (Ballhaus Ost) and Within the Enterim (Hebbel-am-Ufer2). 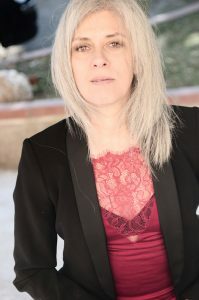 In Berlin, from 2010 to 2013, she commited herself to adolescents with migration background and developed the theater projects, Ick bin een Berliner and Turn Tears to Fire. In the 2016 film Schlaganfall® (www.kurzfilm-wer-Augen-hat.de) written by Giovanna, she combines her experience in theatre and therapy where all that has been explored, lived and experienced flows together. Since 1993 Giovanna developed her individual concept for theatre and poetry seminars (www.poetryflowers.com) and published her own poems.